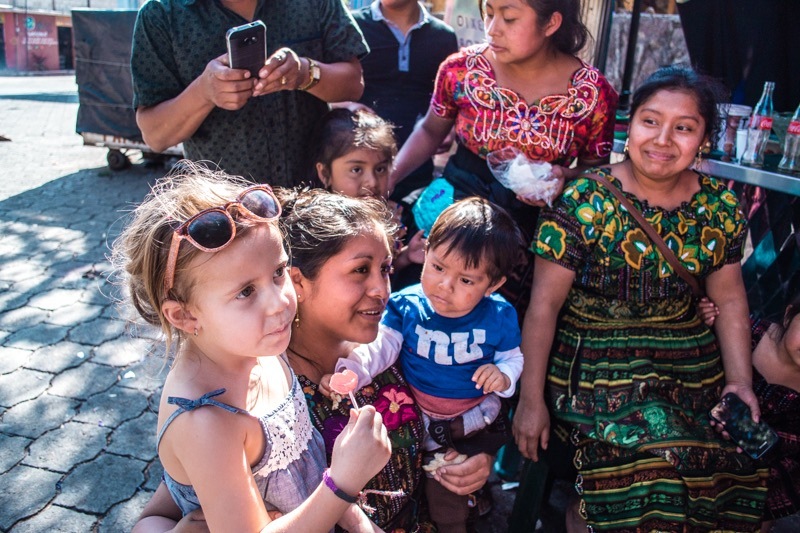 Would you travel with your kids to Guatemala? Guatemala is flying under the radar, as other Central American countries are winning in popularity. It doesn’t mean Guatemala has less to offer. 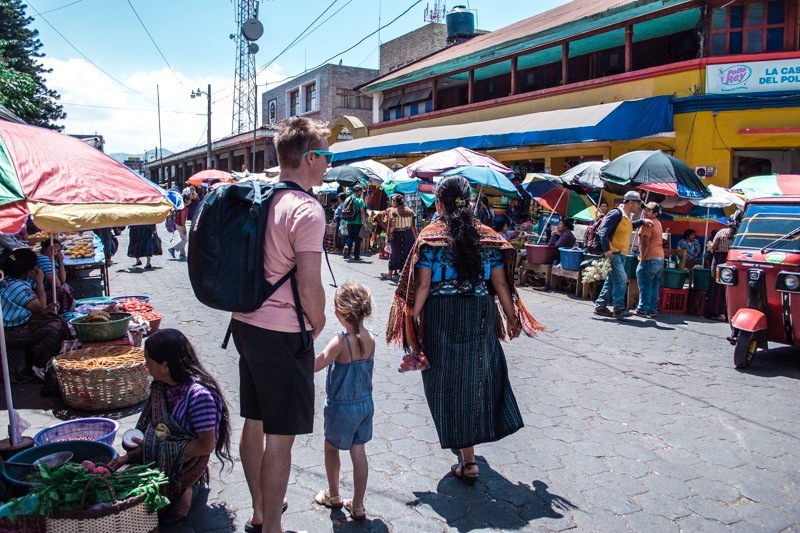 For instance, so far we visited Costa Rica, Guatemala, and Belize in this region, and we came to the conclusion after the trip that we like as much Guatemala than Costa Rica, for different reasons though. Guatemala is a country so rich culturally. It offers breathtaking vistas and landscapes, and its inhabitants are respectful and charming. On the other hand, some roads are in bad conditions, we cannot drink tap water (this might be important when you are traveling with young kids) and Guatemala City can be dangerous. Since we usually don’t go back to the same places twice, this year we wanted to make different and we bought extra cheap tickets to Guatemala City! Flying from Montreal’s airport (YUL), we eased our way through our return flights with Valair, valet parking: it made all the difference since our flights were through the nights and we were extra tired. 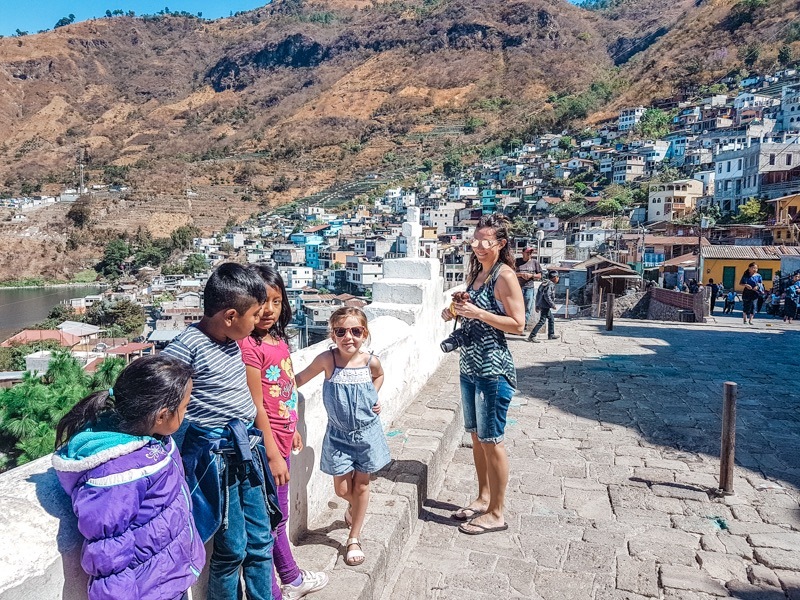 So here’s our 10-day Guatemala itinerary with kids: we rented a car and went on a road trip to see what are Guatemala’s must-see. And we spent 3 nights at each destination. Ten days isn’t long, and our traveling pace has slowed down to keep everyone happy and relaxed. 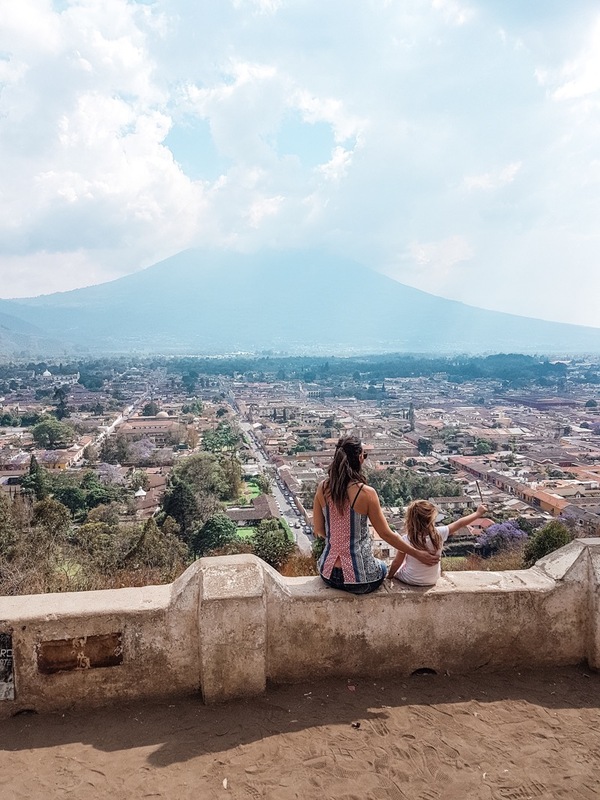 We would have liked to see more of Guatemala, but with this itinerary, you’ll see the best highlights! 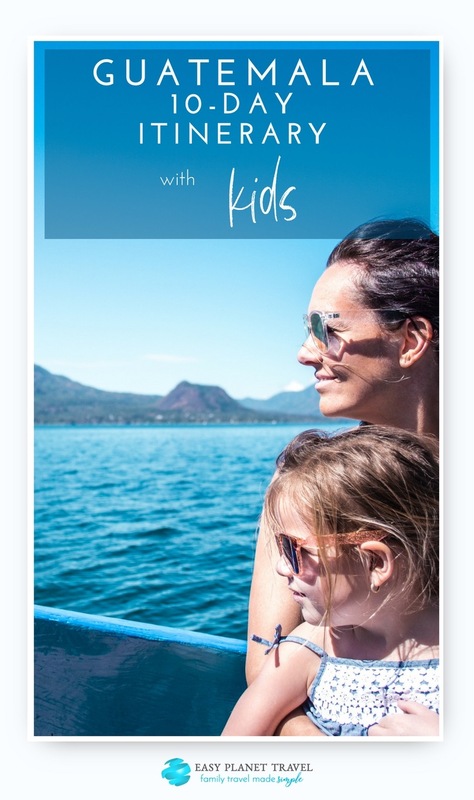 First of all, I have to say that Antigua might not be your kid’s favorite destination. This city is gorgeous, full of stunning architecture and fascinating culture. But that’s probably not your kid’s cup of tea! You definitely want to take a day to walk around town. Everywhere you go, you’ll notice gorgeous buildings to photograph. Of course, you’ll want a photo of your family in front of the Arco de Santa Catalina! The Plaza Central Park is also a great place for people watching, taste local food and buy cheap souvenirs. One surprising thing I would recommend for your family is to visit the McDonald! Yes, this particular restaurant is located inside a very beautiful building and has a superb courtyard to picnic. To have the best vista of Antigua and the surrounding landscape, head to the Cerro de la Cruz. The photos you’ll take there will be breathtaking! One fun activity for kids is the ChocoMuseum, where Emma-Kate learned where her favorite food comes from, and how it is prepared. She even cooked and ate her own yummy chocolate! Finally, I recommend that you hike the Papaya Volcano! We booked a tour in a hotel (almost all hotels sell this tour) to get to the Pacaya Volcano, which is a 1h30 drive. We went in the afternoon, and that’s what I recommend because it is a bit chilly at the top. Pay close attention to your driver: ours almost had 2 accidents only on our way to the volcano. The hike isn’t that difficult. I’ve read on a lot of blogs that climbing Pacaya Volcano is a difficult trek. You will sweat, but unless you are overweight, have a medical condition or never ever exercise, you’ll be just fine. Anyway, you should start the hike on foot, and if it is too hard for you, you can hop on a horse that will follow you anyway! 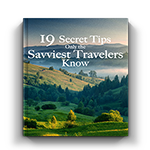 You’ll be walking on a trail all the way up, and you’ll be with a guide, so you’ll be safe. 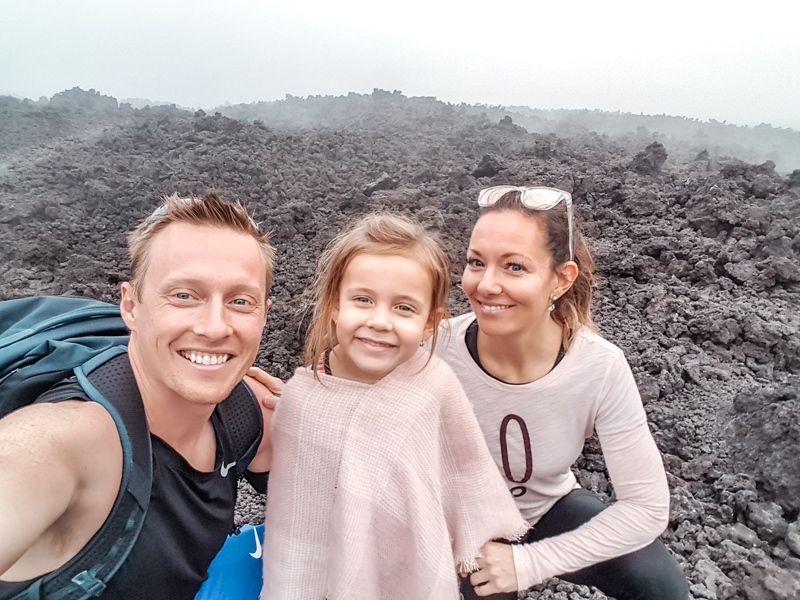 Since all I read before our trip said it was super hard to hike, we decided that me and Emma-Kate (5-years old) would go up the volcano on a horse. It was super fun and cost us $15. We walked on the way down: it is so easy to go down that Emma-Kate walked all the way by foot. 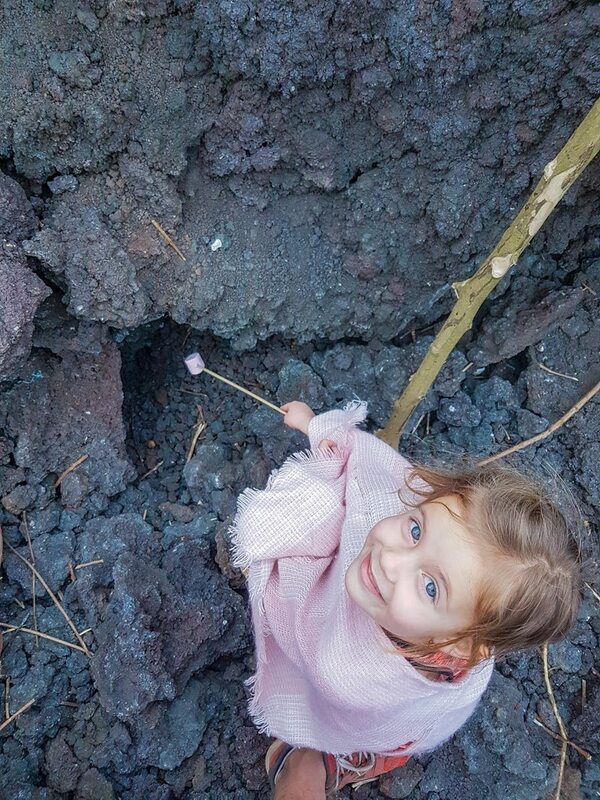 On top of the volcano, your guide will give you marshmallows to roast on hot lava stones. That was pretty cool! While in Antigua, we stayed at the Un hotel en la Antigua, and we became friends with the owners. They are amazing people. This hotel’s location is great, our room was spacious, comfortable and very clean. We loved it! 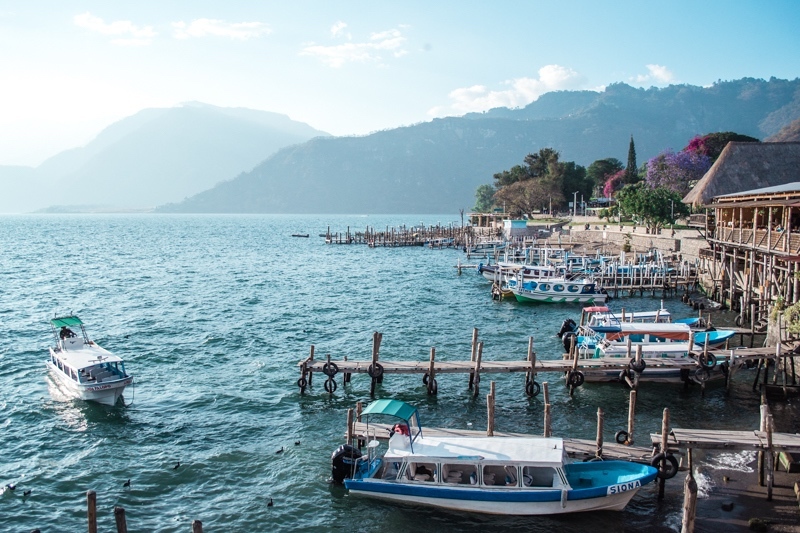 Lake Atitlán is the #1 attraction in Guatemala, and for good reasons: it is stunning. The lake by itself is beautiful. The water isn’t crystal clear, though. 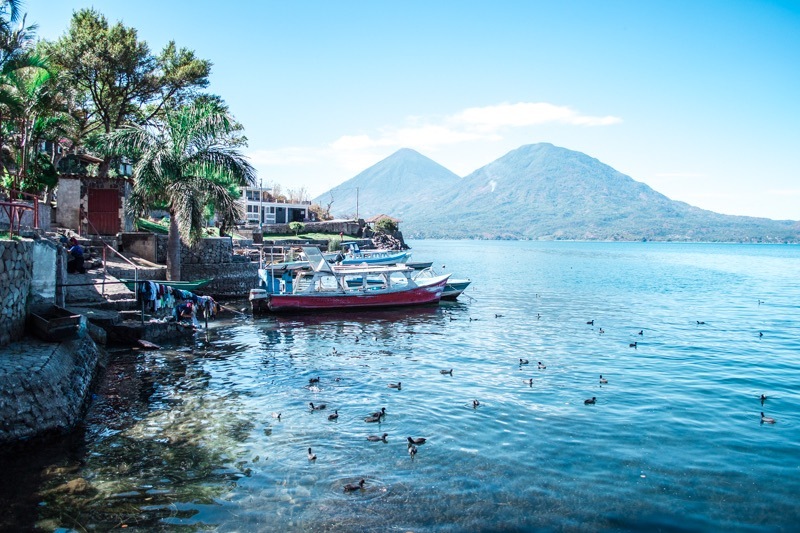 What really makes this place stand out is the 3 volcanoes that surround the lake: the Atitlán Volcano, the San Pedro Volcano and the Tolimán Volcano. As you will have guessed, the #1 thing to do is to take a boat tour (private or taxi boat) around the lake to discover the lovely cities named after the 12 apostles. We decided to rent a private boat with a “driver”, and for $100 we could go anywhere we wanted for the day. We stopped at San Antonio, which is a lovely little town with kids running around and women washing clothes in the lake. 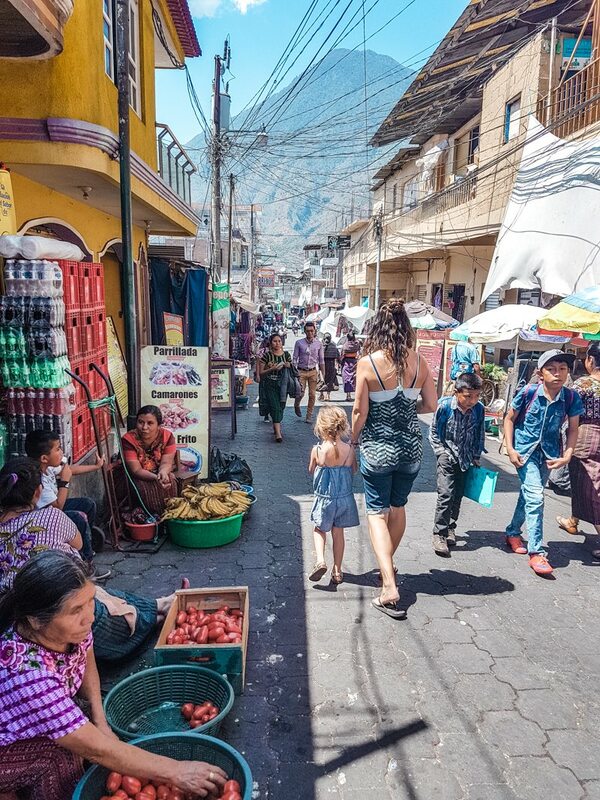 Then we went to Santiago Atitlán: this is the most populated city around the lake. The market is nice to visit. After that, we discovered San Pedro. There is a spot on a hill to get a stunning view of the lake and the volcanoes. Ask any tuk-tuk and they’ll bring you there. Finally, we stopped in San Marcos, which is a hippy town. This is where Emma-Kate got personal with locals and where we drank our 4 PM beer, by the water. Bliss! 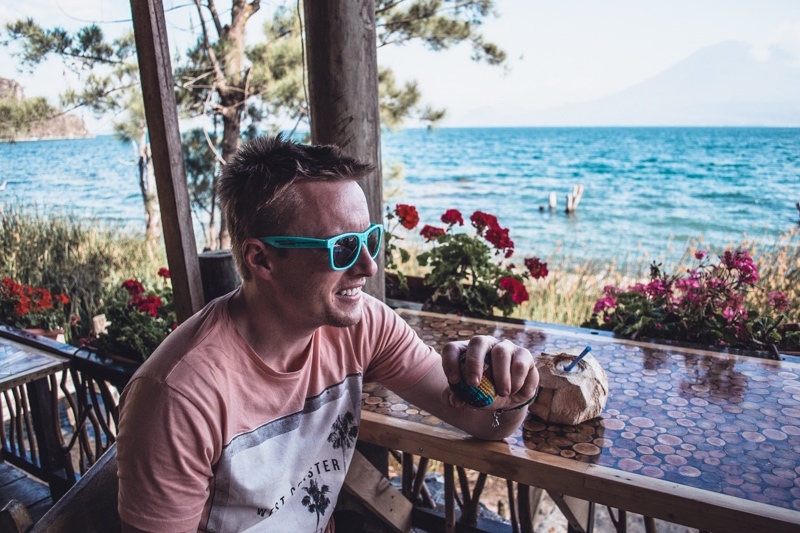 During our trip to Lake Atitlán, we choose to stay in Panajachel, and we booked at the Hotel El Sol. This place was great: super clean, spacious rooms, biggest hot shower! 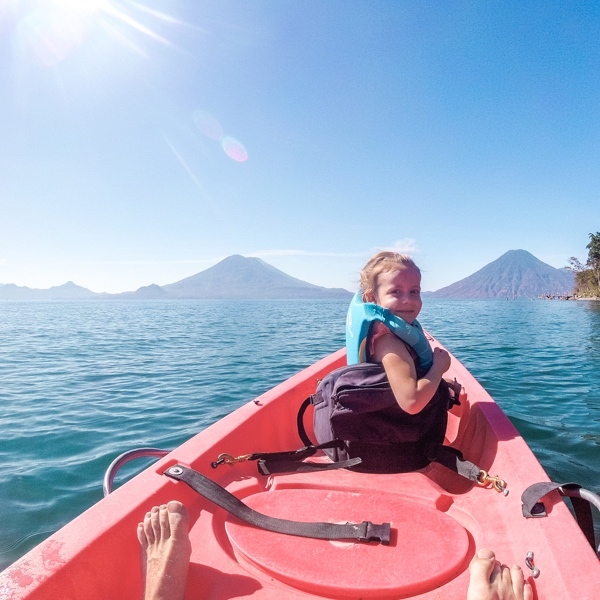 It is a little bit far from the city center, but we like to walk so it was ok.
On another day, we decided to have a Family Fun Day with Kayak Guatemala, also known as Los Elementos Adventure Center. 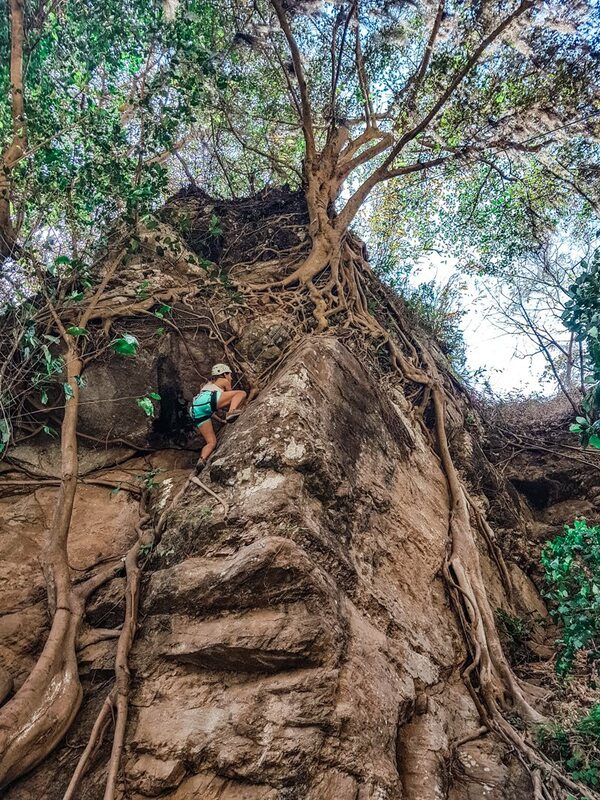 Located in Santa Cruz, this adventure center offers a lot of activities: kayak, paddle board, rock climbing, archery, massages, cliff jumping, and more. We started our fun day with Alex, our guide for the day. We did a very scenic kayak tour on Lake Atitlán. We then stopped so Clinton could jump off a cliff… and lose our GoPro! Did you know that while diving to find our GoPro in the deep water, my husband found 2 other GoPros? Please, if you ever jump off that cliff, don’t even take your GoPro with you. Ours was mounted on the official GoPro bracket, and it opened on impact. Another GoPro we found was fixed on a head mount. Don’t take chances! Even though we easily found 2 other GoPros in the lake, we had to hire scuba divers to reach the depth needed to find ours. But we found it! After all this adventure, the 3 of us had the chance to try archery and then rock climbing! Yes, our little 5-year old girl did rock climbing! She was very much secured with a harness, according to USA security standards. 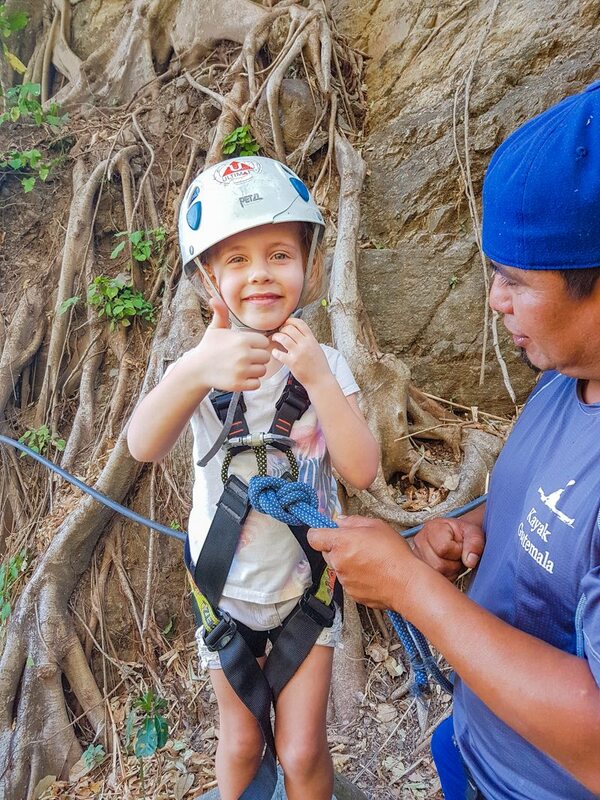 I definitely recommend a day at Los Elementos Adventure Center. This place is so peaceful, the owners and the staff are the most friendly people, and we had the time of our lives with them. Monterrico is located on the Pacific Coast. 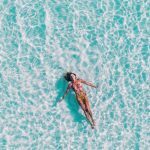 When you’ll search for a place to stay, you’ll probably wonder why all hotels and Airbnb have pools. Isn’t there a beach over there? 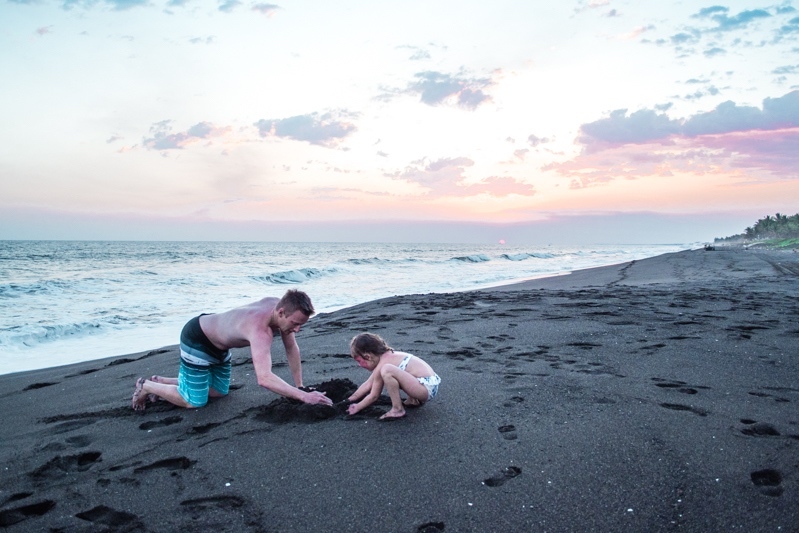 The beach at Monterrico is a beautiful, soft black sand beach. The dark color of the sand makes it very hot starting around 11 AM until the end of the afternoon. Before and after those hours, you can enjoy the powdery sand to build amazing sand castles or walk along the powerful waves and collect seashells. And when the sun is high in the sky, you will likely avoid the beach or run as fast as you can from the ocean to your hotel grounds. Careful: the waves and the underwater current are very strong in Monterrico. It might be dangerous to swim in the Pacific Ocean. We stayed at the lovely Hotel Cayman Suites. This place was perfect! We had a luxurious room, with an amazing bathroom. There are even a playground and multiple pools! You can learn more about our stay at the Hotel Cayman Suites in this article. The little town of Monterrico is cute, with the main street full of restaurants. The ceviche was so delicious! The #1 thing to do in Monterrico, besides the spectacular black sand beach, is the Biotopo Monterrico-Hawaii. 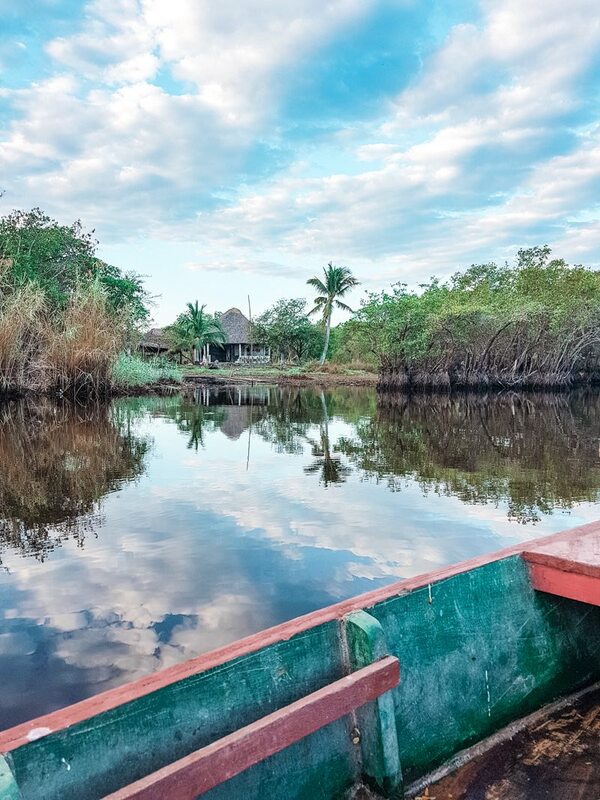 A boat tour of the coastal mangrove swamps to watch so many different species of birds and aquatic life is a must. For Q75, you leave at sunset and spend 1h30 to 2h on a quiet paddle boat and watch a stunning sunrise, hearing so much wildlife. The second most popular thing to do is to visit the Tortugario Monte Rico. Bring your insect repellent, because if you don’t, you won’t appreciate your time there. It is a cute place to visit, especially if you do between the month of September and January when you’ll be able to see the staff releasing baby turtles into the sea at sunset. For a small fee, you can even do it yourself! We really enjoyed our time in Guatemala. We were never afraid for our security and safety. We remained always very cautious though. We also liked our itinerary. 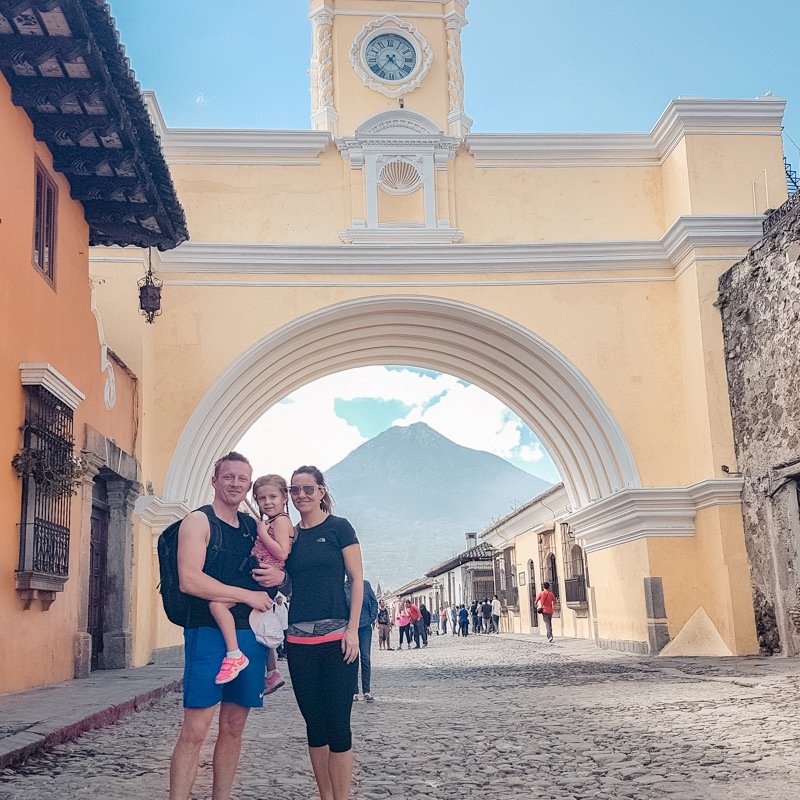 There are other amazing places to visit in Guatemala, but we specifically liked that our trip was so varied: we visited a city, a volcano, a lake, a beach, and we did a lot of different activities too. Have you ever visited Guatemala? Where did you go? What did you like the most? Please share with us your tips by commenting below! What an amazing trip! Guatemala isn’t somewhere I’ve ever really thought about visiting but it looks incredible! I’d love to do the hike up up the volcano, although I’m allergic to horses so I’d have to walk it. Well done for completing the rock climb! This is an activity I’m sure my son would want to take part in too and he is 6.